Food Devotion Sword of the Spirit Bible Lesson, Blessed are the pure in heart, for they will see God. "Blessed are the pure in heart, for they will see God" Matthew 5:8 (NIV). In life there are things that can take us away from God or move us closer to him. For example, the shows we watch, the books and magazines we read, what we to listen to, the friends we associate with, and the activities we do. We should be in the habit of asking ourselves, "Are these things good and pure? Is this something Jesus would approve of me doing?" If not, then stay far away from them, because God wants his children to be "on guard" against evil, to be pure in heart, and not polluted by the world. Do you know that the Bible is called the Sword of the Spirit? By reading it, knowing it, and obeying it, we protect ourselves against the Evil One's attacks. To remember this "on guard" truth of Scripture, let's make Banana Swords. What You Need: Bananas, Magic Shell Topping, Candy Sprinkles. What You Do: Cut bananas in half, (see picture), push a popsicle stick into the center and then freeze it. (If time doesn't allow for freezing, keep chilled before lesson.) 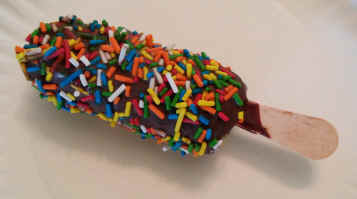 Roll frozen or chilled banana in Magic Shell topping, then roll in sprinkles. Place back in the freezer for a few minutes before eating, (or eat right away). While you enjoy eating your Banana Swords, discuss the importance of knowing and using the Sword of the Spirit to guard your hearts! This object lesson is taken in part from Lesson 6, BE PURE, from The BE-Attitudes for Kids Bible Curriculum.